Farm-focused contemporary cuisine complemented by a notable wine list in a historic, romantic setting. 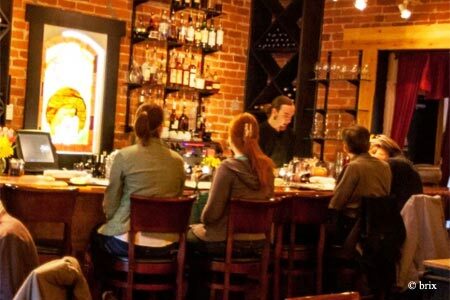 : Brix serves local, sustainable foods complemented by a wide range of wines. The contemporary American menu evolves with the seasons to highlight the freshest ingredients, and cured meats, pastas and pastries are house-made. Menu notables include Sonoma County duck breast with duck confit and plum and shallot compote; steak frites with caramelized cippolini onions and beurre rouge; and pork chops with Italian sausage and cornbread croquette. Brix also has an extensive selection of cheeses that includes international and regional varieties. The wine list encompasses ports and Champagnes and everything in between from Arizona, Colorado and California, as well as the rest of the globe.